I had a pool inspection today. Inspector recommended acid washing gunite pool. Is this something I can DIY or should I pay the pool company to do it? You can do it yourself for much cheaper. I recently did mine cause the CYA was at 200 and the CH was over 1000. I figured that since I was fixing those problems with a drain and fill, why not acid wash as well while I'm at it. I went through about 3 cases of Muriatic acid (6 gallons). I poured the acid into a watering can along with water. I uses a 60/40 or 70/30 acid to water mixture cause my pool walls were really filthy. Other tools you might need would be some long rubber gloves, a brush to brush the acid after you pour it from the watering can, maybe some Bio-Dex to cut the fumes from the acid and some rubber boots. You probably want to get a bottle or two of ph up to neutralize all the acid that will accumulate in the deep end as you wash it down. Almost forgot, you also need some type of pump to keep in the deep end to get rid of the dirty water and acid, as well as to drain your pool to begin with. I just watched some You tube videos to see how people were doing it and went at it from there. Why did they recommend acid washing the pool? Is there scale build up? Most pools do not need to be acid washed and that should be considered a last resort. I think there is some calcium / scale build up on the pool. It looks dirty but I really know nothing about it!! Will it damage the pool? The pool is gunite and light blue diamond brite. Thanks! An acid wash removes plaster from the surface and shortens the life of the plaster. The best thing to do would be to clean up the pool following this process, SLAM. That will take care of the dirty part. And then see where you are. There are several options for dealing with scale but first we just need to see where you are. Thanks, pooldv! I was thinking a drain and refill. Would you recommend just removing cover, debris, and doing a SLAM? It would definitely save me some $$$. Yes, get a good leaf rake and scoop out as much junk as you can and start a SLAM. Draining won't buy you much and isn't worth the risk and hassle. Pooldv--just out of curiousity what are the risks of draining? I'm not pooldv, but one risk where I live is the pool popping out of the ground due to a high water table. During my whole pool remodel, we had two feet of water in the deep end when the drainage pump wasn't running. Pool plaster is supppsed to remain wet. Draining can dry out the pool plaster shorten its life and my eve cause surface cracking that usually resolves itself. Get you gunk and algae problem solved ad then we ca assess the state of you plaster. 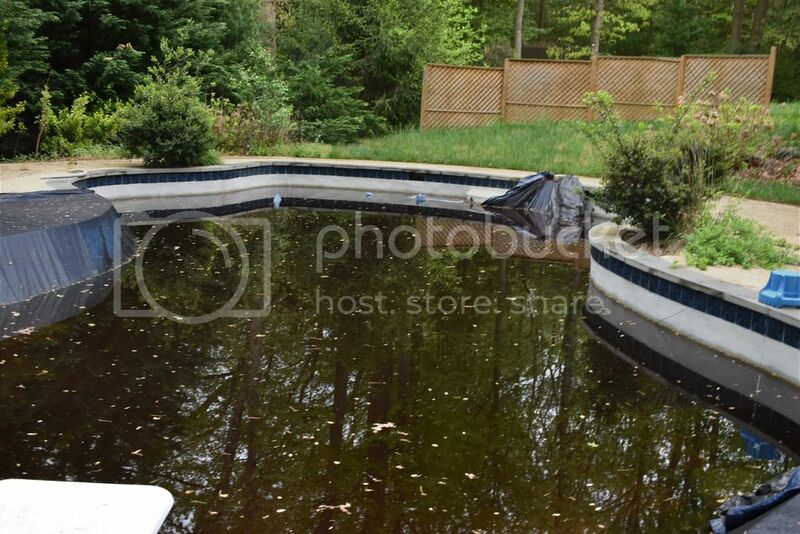 Also, depending on where your water table is there is risk of the pool shell popping out of the ground. And you still have to scoop all the stuff out and SLAM when you refill because there is still algae on the walls. We drain, power wash and acid wash all the time in the Midwest. I wish I was in the south or west where you don't get the staining from the winter and don't need to worry about it. Personally I would drain it and have it cleaned up making sure you have the precautions of a low water table. Also yes, $1K is the going rate around my neck of the woods to have someone open your pool and do the power washing and acid washing. Thanks, everyone. Great information. As of right now I will start removing the debris and see where I am at.